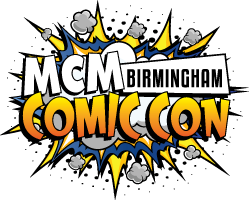 I took the plunge with Bham MCM as my first major con to sell at because I got to split a table with some artists I admire a lot and that brought the cost down, and also because it just happened to be the first big event of the year. In retrospect, this was a terrible decision. It's at the NEC which is a huge conference centre and performance space, and connects to the train station and airport via skyway meaning there are hotels nearby and it's easy for attendees to get in from the city. It's a great venue with a lot of space, a food complex nearby, and a lot of facilities. The downside to this is that it becomes this family event where people come to kill a weekend with the kids rather than spend money. I think the weekend usually hits around 30k attendance but this doesn't necessarily translate to sales. You get a two tables in front of your space, giving you a deep area to present products ahead of any grids or displays. Behind you is a grey backing board so you can hang banners, prints, shirts etc. We got a decent area at the back for suitcases and stock, and a chair for each table too. No bins so take your own bag for rubbish. Small ticket items did okay. Some people by me were selling meme and logo t-shirts at a huge stall. This wasn't great for me, but they sold well from the looks of things. Attendees seem to like items they can wear; badges, bags, tees, pins. Art is not a big seller and people with prints either seemed to have them framed and fancy, or were flogging them for lowlowlow prices. Because MCM stands for movies, comics, and media, this event is everything in one. Video games, sci fi series, anime and manga, plus comic books mean there's no real organisation of layout. IMO they really need to set up a comic village, artist alley, and vendor area as different sections. There's supposed to be no fanart in comic village but of course it was full of it. If you're an anime/manga/JRPG artist in vendors like me, you get lost in daleks and Captain America mugs. You can watch cosplayers in anime costumes bounce between the bright stalls and dakimura/plush shops, avoiding all the dark stalls with Joker posters. Similarly those there for the scifi signings will blank most tables with anime. This would so easily be solved if you had an area for people to go shop for art and fan merch, but I'll admit I'm biased. If they'd have at least extended the orange carpet all around the hall it might have lead people towards our end. The signings were behind us so if people weren't going to meet some talent I worry that they were just skipping our section all together. It was SO slow for such a big venue. Some of our comic/sci fi neighbours also agreed it was a fairly slow event, and various trader groups as well. Seems like a few folks did very well and I imagine that's down to having exactly the right kind of products at the right price, and a healthy dose of lucky placement in the hall. In the end I made profit, but was generally so bored. Couldn't even pass downtime on my phone because the wifi was puny and data couldn't deal with the sheer amount of people - this also made card sales an absolute nightmare. The only staff I met were the security. They were pleasant enough. I'll only do it Bham in Nov if someone I enjoy spending time with wants to split a table again, as a social thing to see friends and hang out. If this was my full time gig I would skip it. Still going to try London MCM though, because that's the biggest event in the country and allegedly has a completely different audience and atmosphere. If you do it, make your display big and have a load of small items ready to plump your sales. Best of luck!